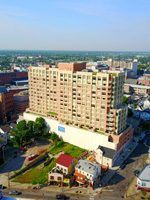 135 Apartments featuring 442 bedrooms for Rutgers University New Brunswick. G.C. was Joseph Jingoli & Sons. Academic Building consists of 5 Lecture Halls and 100 offices for Rutgers University New Brunswick Honors Living Building consists of 284 dorm rooms and apartments featuring 540 bedrooms. G.C. was Joseph Jingoli & Sons. 200,000 SF office building and on site data center. Included commercial kitchen and commissary. 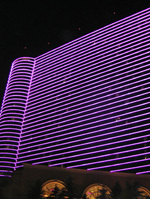 CAS is currently performing work on the Revel Hotel & Casino. CAS has been tasked with furnishing and installing all interior drywall partition assemblies and gypsum / acoustical ceilings for GC Tishman Construction and owner Revel Entertainment. Upon completion in late 2011, the facility will include two towers with approximately 1,900 rooms each, 150,000 square feet of casino space and 500,000 square feet of dining, retail and entertainment space. 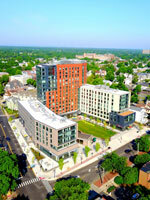 CAS is in the process of completing work on this $41 million project in Princeton, NJ. 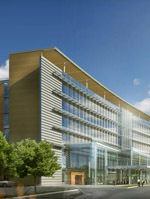 Construction Manager Turner Construction's scope of work for the University Medical Center at Princeton includes the construction of a 636,000 sq. ft., 269-bed replacement hospital with 10 surgical suites, full-service diagnostics, cardiac labs, radiation oncology and more. CAS is currently installing drywall, ACT, GRG and wall protection, and is expecting completion in 2011..
Capital Health is building a new, state-of-the-art hospital in Hopewell Township, NJ. This new medical center will replace the 112-year-old Mercer campus in Trenton. 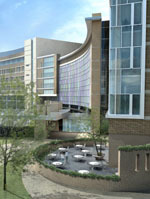 The proposed 540,000-square-foot hospital will have private rooms for greater comfort and improved care. The six-story patient tower will be linked by a five-story atrium to a 320,000-square-foot, six-story building that will house physician offices. CAS is currently performing carpentry and drywall Installation for General Contractor Skanska USA, and are expecting completion in the summer of 2011. 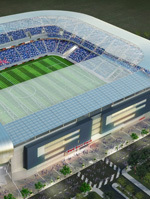 Red Bull Stadium is the new home of the Red Bulls, New York's own Major League Soccer team. Under GC Hunter Roberts Construction Group, LLC and for the Town of Harrison, NJ, CAS performed Drywall installation as well as specialty and acoustical ceilings. Completed in the third quarter of 2009, the stadium seats over 25,000 spectators, and houses 30 luxury suites with over 1,100 premium seats. 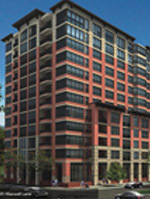 Block B is the 2nd of four distinctive buildings at Maxwell Place on the Hudson, in Hoboken, NJ. Consisting of 376 homes, 1125 Maxwell Lane offers numerous unique floor plans with luxurious and clever interiors designed by renowned architect Michael Graves. Under GC Bovis Lend Lease for developer Toll Brothers, CAS installed drywall and soffits, exterior plaster, shaft wall construction, mill work and acoustical ceilings. 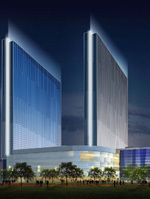 CAS has completed work on the Borgata Hotel & Casino's second tower, The Water Club. This tower offers the Borgata's visitors an additional 800 luxurious rooms to enjoy, as well as swimming pools, restaurants, meeting space, and a spa. A development of MGM Graham and Boyd Gaming, under construction manager Yates Tishman Joint Venture, this Atlantic City tower offers a unique look and feel that distinguishes itself from the rest of the hotel, while at the same time meshes with the familiar elements of the Borgata style.